Click the image for video from the ride! Fine early summer weather and drying conditions made for a great opening round of the 2015/2016 Vinduro NZ Series. 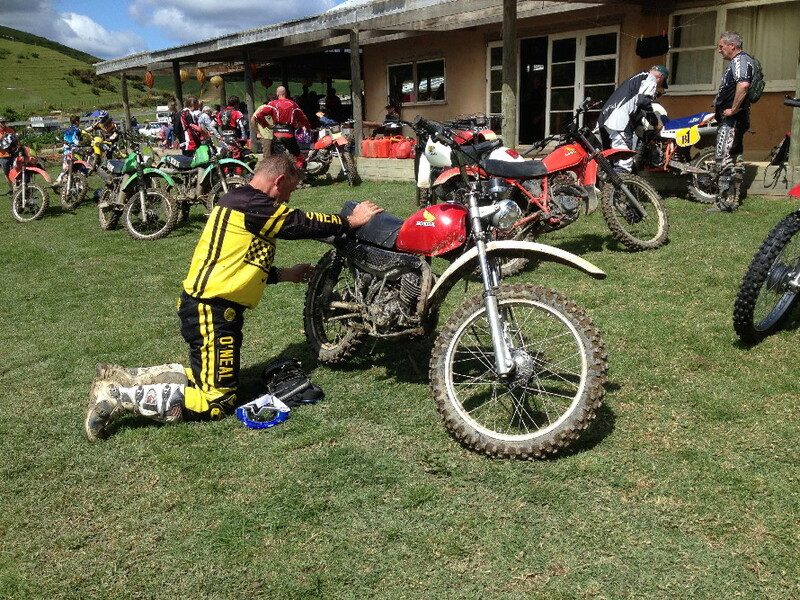 The event was staged at The Farm, a trail riding and motocross complex on the Whangaruru Harbour in Northland. 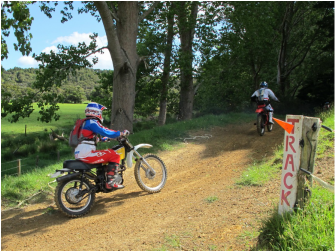 The ride attracting over forty entries from as far afield as Hawkes Bay, including several riders who took the option to trail ride the course without being scored. Significant amounts of rain in the days preceding the ride meant that organiser Mike Bennett had to cut out some of his favourite sections, though the bright sunshine on the day soon had things drying out and riders enjoying near-perfect riding conditions. With the entire course running over a single farm, three laps were required for a total 76 km distance. There was however a wide variety of terrain, several stream crossings, clay farm roads, big grassy hills and roller-coaster bush tracks. As with the two previous Vinduros run by Vinduro NZ half the field had not ridden an event of this type previously. The course was divided into six sections with two loops, named Coastal and Bush. The Coastal loop was mostly fast and grassy rolling hills and if you cared to look up there were stunning views over the Whangaruru Harbour. The Bush loop was as the name suggests a more slippery affair climbing into the ranges with some inspiring terrain and tighter clay tracks. Due to the rain prior to the event more challenging Gold Class additional loops were put on hold and all the riders were sent out on the easier Silver course. However as the day warmed and the ground dried some of choicer Gold tracks were re-instated by the afternoon, the best being The Bush Highway, a glorious twisty bulldozed track through native bush with countless elevation changes. The special test was run over a flowing grass track course right in front of the start area with plenty of off-cambers to test the rider's ability to get the power on the ground. The first lap was not timed to allow riders to get a feel of the special test, but the subsequent two laps were timed to the second. Contrary to last season Honda machines were most numerous, represented by single shock XRs, two rapid twin shock XR500s and several twin shock XLs, plus a rare two stroke MR175. Almost absent this time were Suzuki PE models with only a lone PE175 and TS250 twin shock present for the yellow team. For Yamaha there were the popular IT175s and IT200s, IT250s and an XT250, while Kawasaki were represented by several of the popular KDX200s. Once again there was only a single entry in the 4 speed Vintage class, a BSA B50. Largest class represented on the day was the air cooled Evo 2s, followed closely by Classic short-travel twin shockers. Especially satisfying were the many youngsters, including a posse of local teenagers who tore up the course on Ag bikes. More numberous too were canny folk who have picked up that low tech air-cooled modern trail bikes like the CRF Hondas and Yamaha TTR230 qualify for NZ Vinduros, making for a fun and inexpensive way to participate. Almost all the riders completed the entire course, the only two retirements being due to mechanical faliures and the overwhelming sentiment was that Vintage North had been an outstanding event, both in terms of the riding and the hospitality shown by Mike and Ellen Bennett and their whanau at The Farm. Roll on 2016! For those who missed them Special Test times from this even will be posted at the next round, the VSE on December 5th. Click to start the slide show below.